Both the Seahawks and the Titans decided to remain in their locker rooms and not participate in the national anthem prior to their game in Tenneseee. 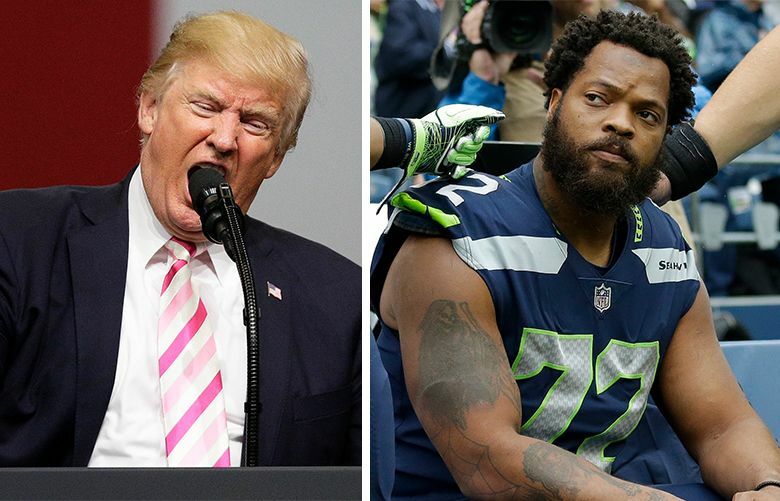 During hours of meetings on Saturday discussing how to best respond to something they felt had to have a response — comments by President Donald Trump on Friday criticizing the NFL and players who have been protesting social inequalities during the national anthem — the Seahawks decided that whatever they did they had to do together. “It doesn’t show the kind of power unless it’s the entire team,’’ said cornerback Richard Sherman. 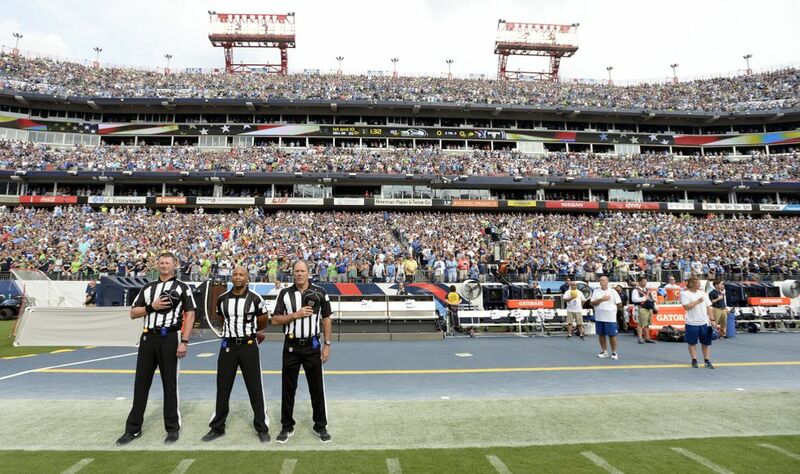 That led to the Seahawks on Sunday deciding to not take the field for the playing of the national anthem before their game against the Tennessee Titans. The Titans also did not take the field, making it the only game where neither team was on the field for the anthem — Seattle and Tennessee players had spoken Saturday and knew the plans of each other. Sherman said many ideas were batted around in what he estimated were at least three-and-a-half hours of talks on Saturday, including kneeling with a flag at half-mast. But while some players wanted to kneel or sit, others did not, and Sherman said the goal was to show unity. “We wanted to do our best to not ostracize our guys, any of our individuals,’’ Sherman said. “Allow them to feel welcomed and not really make them uncomfortable. That’s the worst thing you could do is put your teammate in an uncomfortable position. Sherman noted one reason the team decided not to come out for the anthem is that that used to be the norm — players were typically not on the field for the anthem prior to the events of September 11, 2001. After the anthem sung by Meghan Linsey, the teams then walked onto the field with many players locked in arms. Linsey also took a knee as the song ended. Reaction from the crowd didn’t appear strong. While there was some scattered booing as the teams took the field it was hard to tell what the booing was directed at —it could have been aimed at the Seahawks as the visiting team. There appeared little real fan reaction overall, however. The New York Times reported Sunday night that while teams can be fined for not being on the field for the anthem that the league is not expected to levy any punishment. Players began hearing of Trump’s comments during their flight to Nashville on Friday night. “It was sad to see that,’’ said quarterback Russell Wilson, who said he agreed with the team’s decision to not be on the field for the anthem. Coach Pete Carroll said he was on board with the decision, as well. Carroll said he didn’t think the discussion impacted the game, noting that the Titans — who went on to win 33-27 — also went through a similar process. “I don’t think it had any factor on the game at all,’’ Carroll said. Carroll said he had specific talks before the game with defensive lineman Michael Bennett, who has been sitting for the anthem. Seahawks defensive lineman Michael Bennett talks about the team’s decision to stay in the locker room for the anthem. Players said they did not know if they will continue to not be present for the anthem. “We haven’t talked about that as a team,’’ said Bennett. Receiver Doug Baldwin, though, spoke passionately about what he felt is the need to continued action of some sort. He followed up his plea for action in an interview Monday on CNN. “I think it’s scary that we have a man in office who was elected to protect our basic rights and yet he has shown recently the opposite,” Baldwin said. “I think the media – a lot of the media – can understand, because they’ve gone through very similar situations with him. But, for us as players, directly being called out about not being able to express ourselves – which this great country, and many men and women who have sacrificed their lives for us to be able to express ourselves in that way. That’s the foundational core of who we are as a country, and for that to be threatened by the man who is at the head of the table for our country is a very serious thing. I hope that that message is loud and clear for anybody who’s listening, anybody who’s watching, that they recognize that this is a dangerous time and we recognize that.